It’s inevitable. 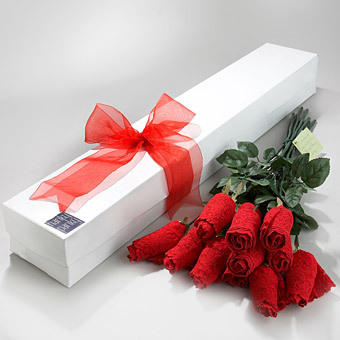 Someone is going to get you a wedding gift that isn’t exactly on your registry. You may think you’ve covered all your bases in your registry and by the end of your honeymoon you’re going to come home to all the china, appliances, and towels you needed and wanted. But, someone on your guest list is undoubtedly going to try to think outside of the box and get you something you “really” want. Or it is very likely that you’ll end up with double gifts from your registry. But seriously, what are you supposed to do with neon-pink-zebra-head book ends or two toaster ovens? First is the obvious: return it. Fingers crossed the giver of the bad gift left a receipt in the package and you can painlessly return the item and use the value for something useful. Or you can always tell the gifter of one of the two blenders that you ended up with two of the exact same thing and you’d kindly like to return one. Just do it with gratitude and grace and the gifter hopefully won’t be offended. Of course its rarely this easy or we wouldn’t need tips on what to do with a 3ft ceramic cherub. In such a case consider selling it. Ebay and Amazon are the perfect places to sell the random gifts you get when you don’t have a receipt to return it to the original retailer or vendor. There are plenty of other sites to sell your things through too. Just do some research to make sure the site is legitimate and not a scam. You can try to sell it at pawn shops or other resale stores too. There just tends to be less of a payout to you with these options. Coming in with the least amount of payout is a donation. Maybe you’re willing to take a hit, not get your gift, and just get that creepy painting of you and your new spouse that your “artist” cousin painted for you out. of. the. house. Seriously, is that what your eyes look like? One last tip- check the registry’s return policy before you sign up and start making that wish list. Some stores will allow you to return an item from your registry, no receipts or questions asked. Some work like usual- no receipt, no return. Just try to find the one that’s perfect for you and your guests’ price ranges. It’s never easy to accept a gift that you… well… hate. Just smile, thank them regardless (thank-you note included) and try to graciously if not secretly get rid of that thing. 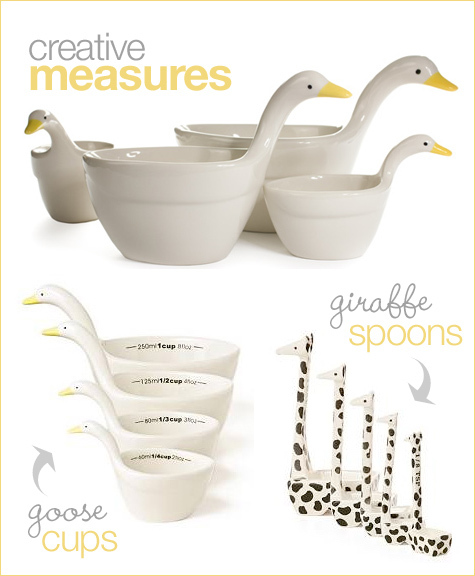 Most of the time measuring cups and spoons live little room for excitment, but not these! I first spotted these on the Hostess with the Mostess blog and then ran across them again on the Anthropology site. The little geese and giraffes seemed to be calling my name! So, I decided to share them with everyone because they would make for a unique wedding shower gift! Who else do you think is going to have a gift this cool? No one! Roses are Red and Thongs are Too! This is a great alternative to your typical pastry brush! Unlike its traditional counterpart this one will not leave nasty little hairs in your food! It is also dishwasher safe, so you do not have to have separate ones for meat and pastries. These brushes are have non-absorbent, heat-resistant silicone bristles that provide even distribution, don’t retain foods, and are easy to clean. How many times have you gotten a recipe from a loved one that is simply huge? They expect you to feed an army! Instead of racking your brain about the conversions and trying to recall all of your fractions from primary school, you can turn to this little tool. This recipe wheel will make you a whiz at conversions and multiplying or dividing recipes at a glance. The rotating two-disk system allows for quick locating of the permanent, laser-etched data. Magnet also affixes to kitchen appliances for easy reference. Whoever thought of this idea is pure genius! . This handy device allows you to select the amount you want to measure, from 1/8th to 1/2 cup (or 2 tablespoons to 9 tablespoons) then scoop up the exact amount of your ingredient, whether it be liquid or dry ingredients. 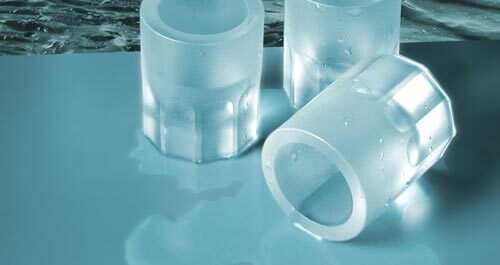 This is a great space saving tool that can take the place of those bulky measuring cups. This has to be one of the greatest inventions ever! A normal colander takes up SO much room in your cabinets and if you are like me, you need at least two if not four! That is a lot of cabinet space wasted, but not anymore. These fold up and take half the room in your cabinets, leaving room for more fun gadgets. Although the salad spinner only has one general purpose, it is a must for you salad lovers out there. Washing the lettuce is one of the hardest things to remember to do and if you forget, the dressing will not stick to the lettuce! Waiting for it to air-dry takes forever; patting it dry with paper towels doesn’t do a thorough job and can leave paper fiber on the greens. Yuck! Rinse and chop foods with this ingenious two-piece prep assistant. Use one side for meats, the other for vegetables. Convenient silicone colander nests into the hardwood cutting board, then collapses flat for storage. Whip up frozen drinks, blend the perfect marinade or chop vegetables and more with an immersion mixer. With this terrific tool, you have the power, variable speeds and variety of attachments to do it all. The wire whisk allows you to puree and mix ingredients for ideal glazes, marinades and so much more. The blending rod lets you blend from within liquids like mixed drinks, soup or milk for the perfect taste sensation every time. This baby will also chop foods and is small and easy to store! No more, standing over a hot fire, dying of heat exhaustion for your food to be done! This timer/thermometer allows to check the temperature of food in the oven or on grill from anywhere in the house. You can be up to 100 feet away from the food and will be alerted when your food is at the correct temperature. This is a great little cutting tool. The mandoline lets you slice like an expert. Cut apples, potatoes, carrots and other produce with uniformity and precision. Want waffle cuts or crinkle cuts? This little baby has you covered! This is the mother of all mixers! The Artisan mixer has a 5qt. bowel with 325 watts of power and 10 speeds. The head also tilts back allowing easy access to your mixture. However this is no ordinary mixer! You can buy attachments to make this mixer super useful. It can become a food grinder, an ice cream maker, a pasta maker, or sausage stuffer with the right attachment. Bridal Party Tees is excited to announce that we have added a great new product to our collection. You can now get personalized aprons! These aprons make a wonderful wedding shower gift, that the bride is sure to treasure and most of all use! The aprons are personalized with your own special message. Does the groom like to cook or BBQ? Then you can get one for him as well. These aprons also make a wonderful wedding party gift that is something unique and wonderful. The best thing is that every time your wedding party wears them they will remember your wonderful day! Are you looking for the perfect tee for your rehearsal dinner or bridal party? If so then we have just the thing for you! We have just released our newest addition to our line of customizable apparel. This tee is a take on the classic crew neck that you new and loved, with a fun new touch. This is great fitting tee, updated with longer length and a two-tone style detail. 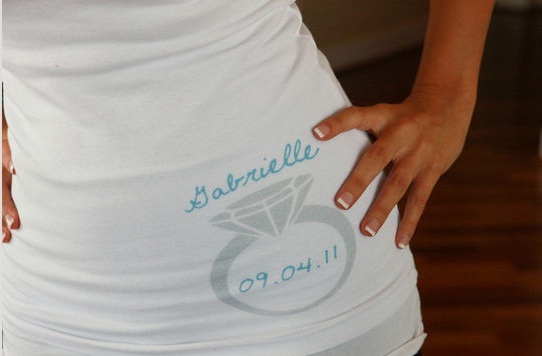 Personalize this tee for any of your wedding events! Design yours now! If you have junior bridesmaids, you know they can be hard to buy for. You want to get them something they will like and will use. Well, if you have a music lover in this bunch, I have just the thing for you. Now your girls can listen to their I-Pods in style. 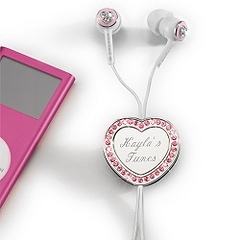 These genuine crystal earbuds have a clip-on charm pendant that is ready for your personalized message. Add a warm thank you, her initials, or your wedding date and you have a one of a kind gift they are sure to love. Check it out!